We’ve featured numerous chic, eco-friendly mama-baby matching outfits and feminine diaper bags on Inhabitots — and we wish there was more green baby gear designed especially for dads! Diaper Dude helps fill the gap in the market with their hip Eco Dad & Baby Set, which pairs a multifunctional, masculine messenger style diaper bag, with matching ‘daddy and me’ clothing. 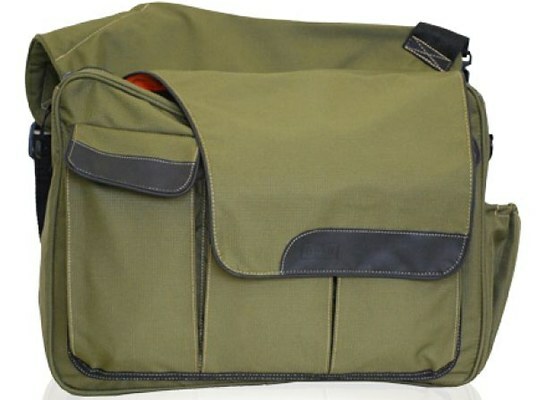 The Eco Dad & Baby Set features the ergonomic Green Dude Diaper Bag, which is made of recycled PET material (plastic water bottles) rewoven into durable fabric. The bag has the same great features found in all Diaper Dude messenger style bags: comfort padding, three zip-closed pockets for wipes, bibs, food and toys, an elasticized bottle pocket, cell phone pouch, large inner compartment with zip-closed pocket, and a padded changing pad. The Eco Dad & Baby Set also comes with the Diaper Dude So Easy to be Green 100% organic baby rib cotton one-piece and a matching T-shirt for dad in 100% organic fine jersey cotton. Extra green accessories dads may opt for to keep their bag organized: the Eco Pacifier Holder and Eco Bottle Holder. 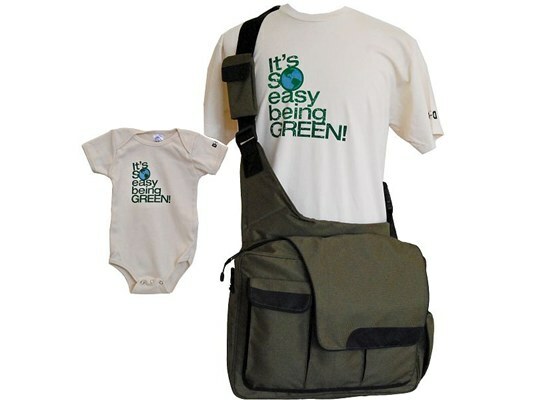 Bonus: dads will love that a portion of proceeds from sales of the Eco Dad & Baby Set will be donated to Global Green USA! We've featured numerous chic, eco-friendly mama-baby matching outfits and feminine diaper bags on Inhabitots -- and we wish there was more green baby gear designed especially for dads! Diaper Dude helps fill the gap in the market with their hip Eco Dad & Baby Set, which pairs a multifunctional, masculine messenger style diaper bag, with matching 'daddy and me' clothing.